It was my understanding selecting increments meant the last.fm playcount would increment when it's played. Well, the way it works right now is that it adds 1 to %lastfm_play_count%, whenever %last_played% is more than 5 minutes greater than %lastfm_last_played%. This will have the effect of bumping the %lastfm_play_count% once the song reaches 1 minute elapsed and %play_count% increments, but it also will bump %lastfm_play_count% if for whatever reason foobar counted a play, but it was never recorded in lastfm (scrobble was ignored/lost, didn't play 50% of the song, etc.). This makes %lastfm_play_count% behave more as a super conservative "guess" at total active playcount: i.e. we know lastfm has 14 scrobbles of this song, and there's at least one we don't know about. With the option enabled, could you play Stories From the Streets all the way through (and make sure it gets scrobbled), and then see if the numbers sync back up? I played said track with increments enabled. It was at 14 actual plays and 14 actual scrobbles but %lastfm_play_count%, indicated 15 plays as seen in the previous screenshot. When played fully it changed to 15 actual plays and thus equals %lastfm_play_count%, the actual checked scrobble is also 15. So now I have this particular track correct while all other are off by 1. If I disable increments, restart foobar all other tracks are correct but now it's Stories From the Streets that's wrong. %lastfm_play_count% is at 14 and only when I import it gets corrected to 15. 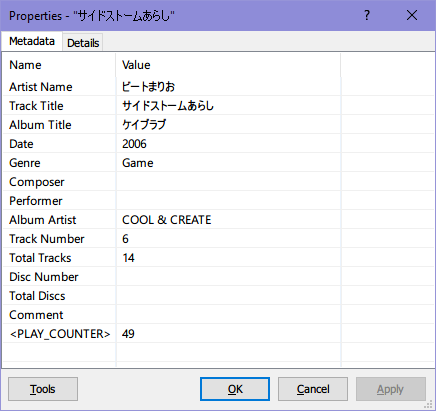 I played the same track again this time with increments disabled and the %lastfm_play_count% doesn't increment. Again, only when importing does it sync back up. I can see why you'd implement the increment option. It's ok for as long you don't create a full comparison list like I did. The numbers didn't make sense to me. Some were right, some were not and always off by 1. I think I'll be handling this differently, I have a dynamic playlist of recently played tracks of the last 24hours and just gonna update them with an import and sync them back up that way. a bunch of times which is a bit awkward. Also, thank you again for this plugin, it's really great! Unfortunately, I don't want to include %play_count% in the component itself because that relies on foo_playcount and doesn't come from this component. Probably 90% of users have that installed, but I still run into some who don't, and because I don't control foo_playcount it's hard to define a perfect solution there. Using those is a little better for the use case where scrobbles were lost/missing/couldn't be found in last.fm. Oh yeah that makes sense! Any ideas what might be causing this, something I missed? Not sure what's happening here, but for debug purposes the best thing you can do is open up the console, start playback of a song having this issue, and then copy the last.fm URL that's shown in the console and paste it here. That'll enable me to debug. This feature was added by marc2k3, so more thanks to him for his continued contributions! Understandable! I found another song with a special character in it that isn't getting the correct playcount: 5% TINT by Travis Scott. 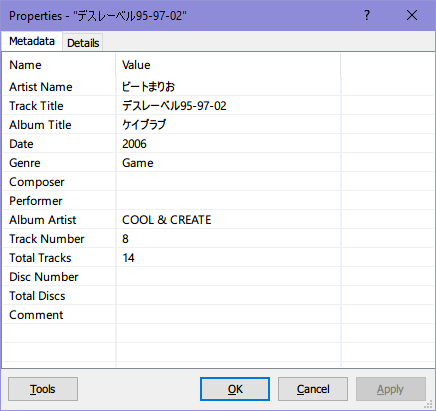 Also for デスレーベル 95-97-02 (for reference it's called "beatmario - death label 95-97-02") I noticed I was missing a space between the name and the dates, so with that fixed I somehow got 19 plays out of the 43 on last.fm. I figure one beatmario song is as good as any other one for diagnostic purposes, but let me know if you need more! Thanks, that's super helpful. I was stupidly not escaping %s so that wasn't working. Fixed now. The issue with your デスレーベル 95-97-02 is that duplicate scrobbles are being removed. See the tooltip on that option and see if you need to leave it checked or unchecked. Unchecking it shows the full 43 scrobbles. Anyway thank you for the update as well!